I was excited about Endgame, I was. I was excited because Chloe Dykstra instagrammed it and I've admired her since pre-heroes of Cosplay so when I saw an opportunity to get an early copy, I jumped at it. Unfortunately, this is not going to be a positive review. I'm going to start by talking about the book, just the words on the page. It was.. alright. My review is basically a shrug. It wasn't an original idea; 12 teens have to find keys and kill each other in the process? Yeah. Okay. Aliens? Gods? An interesting idea but the Battle Royale/ Hunger Games set up just seemed too familiar. The writing was basic, I think with my sticky note system there was four sentences/ paragraphs where I thought- oh that is nice writing. And that's really low for me, I prepared many sticky notes for this book and was sorely disappointed at the result. And considering that the book was written from about 14 different perspectives, I expected to get more than one style. Not everyone thinks alike but it would seem like it if aliens came down and picked this book to read first. And the characters? So unlikable. It's rare that I can't find one character to latch onto and be like this one, I like this one. Two were bearable. But I just didn't understand the rest of them or why they were doing what they were doing. Of course, the cliffhanger ending. But is it going to make me pick up the next book? No. Much like Divergent, I'm just going to google it. So let's get on to the two things about this book that had to do with the book but not the words on the page. Firstly, James Frey. James Frey is a man who lied in his autobiography and is still getting published and I presume, a large amount of money for his trouble. I think this article says it better than I could. Secondly, the gimmick of it all. $2,000,000 or £1,229,202 worth of gold to be split between the three books, put in glass cases in Vegas. There to be opened live on YouTube by three people who figure out the clues, designed by three MIT PhDs in the books and find the key. I'm just reminded of Charlie and the Chocolate Factory, and the fact that it is worldwide just makes me think that it will be won by the person with the most financial backing. But that is conjecture. Basically I just think $2 million is a lot to sink into these three books. I really wanted to like this book but I couldn't. In short, want some entertainment called Endgame? Watch the genius TV show. Still want to read it? You can buy it here . 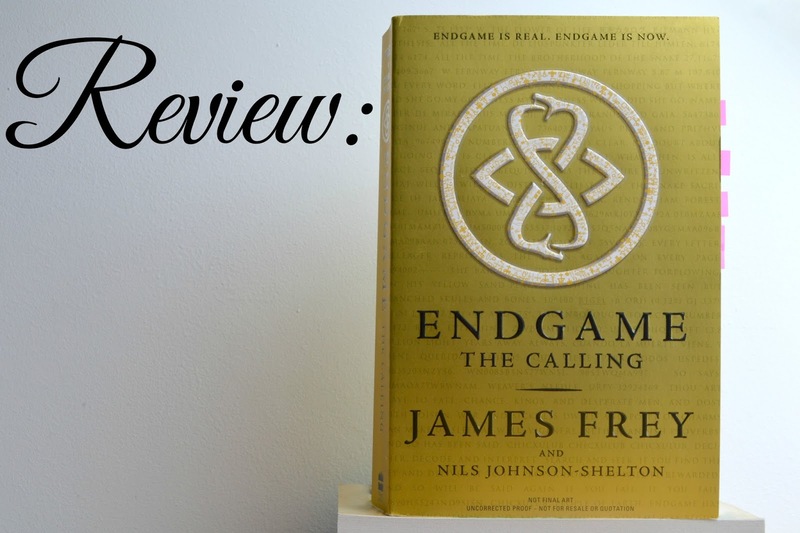 What do you think of Endgame? *This book was sent to me for review. It has not changed my opinion. This post contains Amazon affiliate links which means if you buy anything from the links, I get a few pennies at no extra cost to you. Pretty neat, huh?